How to make curtains, some help and instructions. 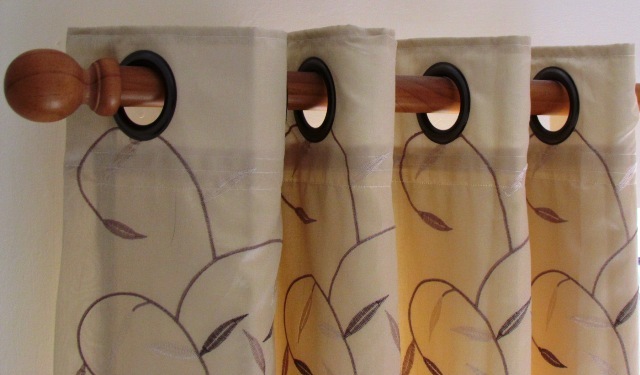 Ever wondered how to make curtains but didn't know where to start? A lot of people would be put off just at the thought of it, but it is quite straightforward and basically straight sewing. The one part that is a little overwhelming is the amount of fabric some curtains take. There are a few steps that need to be addressed beforehand such as what style of heading either eyelet, pencil pleat, or tab top. The type of track or pole to be used. Make sure the window has been measured, the amount of fabric calculated and whether a lining is to be added. All these questions depend on the amount of fabric you will need. There are many outlets for fabric both on the high street and the many online sites. The curtains can be made before the heading is in place. Iron the material if necessary to give a smooth surface. Lay the fabric wrong side up and measure the cut length of the fabric. That is the finished length and extra material for the heading and hem. Sew the lengths together selvedge to selvedge in order to get the width needed for each curtain either 2 widths or 1 + 1/2 widths. If the material is much wider than the window then possible only 1 width is needed. Press seam. Measure the side seams, pin and press. Turn the raw edges to the inside and sew along the turned hem. Turn the raw edges of the hem under, press and turn up hem to the required length and either machine or hand stitch in place. For full length curtains any machine sewing will not really be noticed.The curtain at this stage should now have the side seams and hem turned and sewn. If these are to be lined, use the above steps with the lining fabric making sure the sides and hem is shorter than the curtain so it does not show on the right side. This just leaves the heading which will be different for pencil pleat, eyelet or tab top curtains. 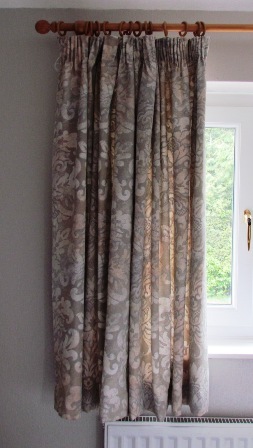 How to make curtains by finishing with a pencil pleat heading. Place curtain fabric right side down and lining fabric (if needed) right side up on top of curtain fabric. Turn down the top of the curtain catching in the lining underneath if necessary. Another way the lining could be caught in is by placing it right side up so it is just lower than the curtain edge. Pin and press with iron. Place the pencil pleat tape on top of the folded edge of the curtain or the curtain and lining. Pin in place along the top and bottom edges so that the tape does not slip while sewing. Machine sew along the top and bottom edges of the heading tape sewing both in the same direction to avoid any puckering. When sewn gather the tape by pulling the cord of the heading tape, secure both ends and then ease the gathering evenly either before or after hanging on the track. How to make curtains by finishing with an eyelet heading. If the curtain is going to be lined place the lining between the folds of the heading and pin the top and bottom edge so the lining does not slip down. Work out the position of the holes which are usually 6 ins apart (15cms) make sure there is an even amount or the wrong side will face into the room. 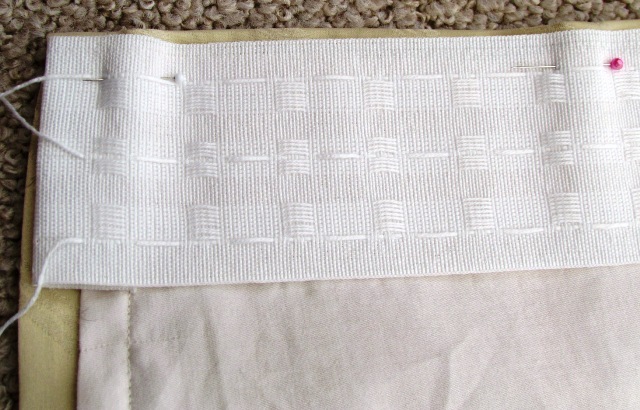 The distance between each eyelet can be adjusted to get even folds. Mark where the eyelets will go and pin around the markings. This is to make sure the material does not slip. Continue for positioning all the eyelets. Cut out around the eyelet marked position and place one half of the eyelet ring which has the longest middle. Remove the pins and place the other half of the eyelet over the first half and press down well to clip them together. Continue until all the eyelets are in place. Repeat for the other curtain and when done so the eyelet curtains are now completed. How to make curtains by finishing with a tab top heading. Cut out the tabs the length wanted and double the width so there is only one seam when folded to the width wanted. Place right sides together and sew seam. Turn tab right side out and press so that the seam is in the middle of the tab back. Continue until all the tabs have been made. Place the tabs on the right side of the curtain keeping the distance between them equal making sure one is placed at each end of the curtain first. Take facing and turn up a 2.5cm or 1 inch hem. Place facing right side down over the pinned tabs on the right side of the material. Pin facing to material catching the tabs as well. Sew seam. Press facing to the wrong side of the fabric allowing the tabs to be at the top of the curtain. The bottom edge of the facing can be slip stitched in place or machine stitch if wanted. In the ones shown in the picture the top seam of the facing was top stitched for extra strength and the side seams were also machine stitched closed. Enjoy learning how to make curtains.